When we first came up with the idea of the Pairings Box, I’m not sure I ever had the intention of following through. But here we are, having spent the weekend packaging our Premium ingredient, hand-stamping virtually every element (tasting notes, boxes, tags) and turning our guest bedroom into a supply room. If there’s one thing that hasn’t stressed me out about the process, it’s being able to lean on Matt every step of the way and to discover how giving family and friends are with their time. Friends, old and new, have come forward to lend their hands, hearts, and ears, and we couldn’t be more appreciative. My mom, an amazing graphic designer (an architect by training) has spent countless hours designing our recipe cards, not to mention, countless more fixing typos and updating copy due to my eleventh hour freakouts. My parents have driven all around the Bay Area dropping off deliveries and providing invaluable advice and guidance. This weekend, our friend Jeff, and the lovely Kimberley came over to our place to help us work on the Pairings Boxes. We knew we’d be putting them to work, but we hoped that we could provide a fun environment. So we threw on some tunes (everything from 90s hip hop to Beirut and Jorge Ben) and I whipped up these punched up Egg-In-A-Hole Toasts. For good measure, I added some lemon zest to the ricotta (one of my favorite combinations) and shaved plenty of Parmesan over the eggs. I made a few extra toasts to make sure we were all well-fueled. You could eat these with a fork and knife or with your hands. The extra ‘holes’ of bread, crisp and toasted on the outside, are fantastic to munch on plain, or with a bit of jam. There was plenty of coffee — which lasted us well into the late afternoon. After Kimberley and Jeff left our house, we looked at what we’re creating. What we’ve created. Despite the fact that we inevitably have no idea what we’re doing and have probably made a million missteps (reminder to self: don’t send emails to people on Friday nights and never assume that when a vendor tells you ‘two days’ that it will actually take two days; it will always take longer), I am incredibly proud of what we’re going to be shipping out to subscribers. I’m gonna go out on a limb here and say that I think you’re really gonna like it. If you’re on the waitlist and have the opportunity to purchase your subscription, I hope you decide to give the experience a go. I promise we’re working really hard to make it super awesome. Lastly, I’m awed by the generosity of people, not only of those whom I’ve known for years, but of those whom I’m only now just beginning to know. 1. 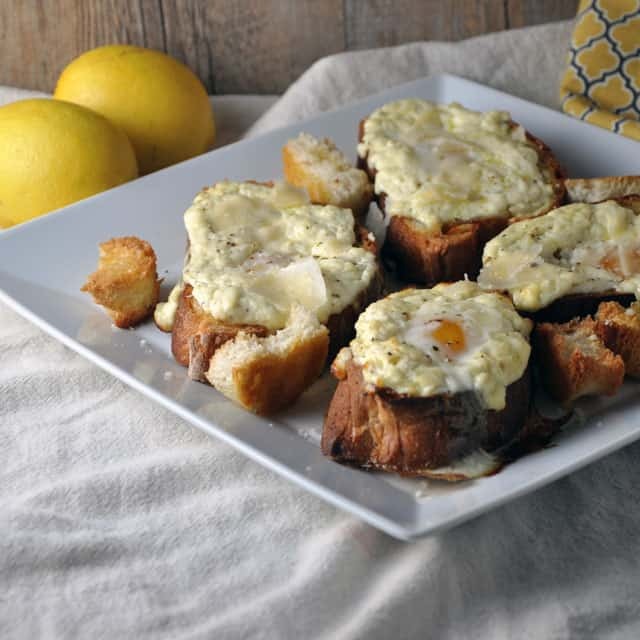 Preheat your oven to 400 degrees F. Use a very small biscuit cutter (or just your fingers), to cut or tear a yolk-sized hole in each piece of bread, reserving the holes. 2. Place the pieces of bread, along with the torn pieces, in two baking dishes. Brush the bread pieces and toasts — on both sides — with olive oil. 3. Place the bread in the oven for about 10-12 minutes (until it’s nicely toasted). Watch it closely to make sure not to burn it. 4. 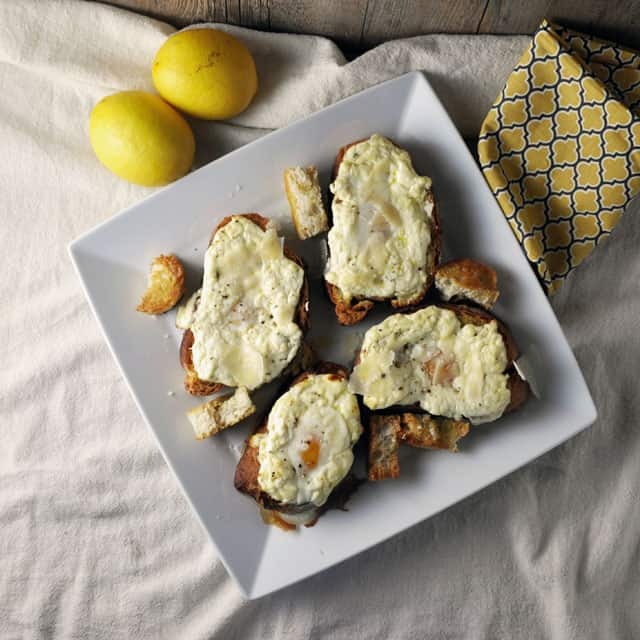 While the bread is toasting, combine the ricotta, with a 1/2 teaspoon of salt, freshly ground pepper, thyme and lemon zest. 5. Spread the lemon ricotta mixture over the bread, making sure to leave the hole open. Drizzle the ricotta with olive oil. 6. Carefully break one egg into each hole and season it with salt. 7. Bake the toasts for about 12 minutes (or until the whites are set). 8. To serve, top the toasts with shavings of Parmesan and more sea salt and pepper. Kind of obsessed with them right now. More, on the Turntable.